Cyclooxygenase-2 (COX-2) plays an important role in Cholangiocarcinoma (CCA). Therefore, targeting COX-2 alone or in combination with other therapeutic agents may be a potential new effective treatment for patients with CCA. This study aimed to investigate whether Interleukin-6 (IL-6) receptor antibody could enhance the inhibitory effects of NS-398, a selective COX-2 inhibitor, on CCA cell proliferation and invasion. Human extra-hepatic CCA cell line QBC939 was used. Cell proliferation and invasion was examined by CCK-8 assay and transwell assay, respectively. The levels of Prostaglandin E2 (PGE2) and IL6 in the supernatant of QBC939 cells were measured by ELISA. The administration of NS-398 and/or IL-6R antibody markedly decreased the production of PGE2 and IL6 in QBC939 cells, and inhibited the proliferation and invasion of QBC939 cells. The combination of both NS-398 and IL-6R antibody was more potent to inhibit the production of PGE2 and IL6, as well as the proliferation and invasion of QBC939 cells than either agent alone. Moreover, the inhibition of QBC939 cell invasion by NS-398 and IL-6R antibody was abrogated by pre-treatment with PGE2. In conclusion, NS-398 and IL-6R antibody have synergistic anti-tumor effect on CCA cells. Our findings provide a rationale for the development of COX-2 and IL6 based combination therapy for effective treatment of CCA patients with poor prognosis. Accumulating evidence suggests that Cyclooxygenase-2 (COX-2), an enzyme which can induce arachidonic acid into prostaglandin, plays an important role in the pathogenic process of various cancers including Cholangiocarcinoma (CCA) [1-3]. In particular, Prostaglandin E2 (PGE2) and COX-2 levels were high in CCA tissues, and the inhibition of PGE2 synthesis and its biosynthesis-related enzymes markedly suppressed the growth and migration ability of CCA cell lines . Therefore, targeting COX-2 alone or in combination with other therapeutic agents may be a potential new effective treatment for patients with CCA. Autocrine and paracrine expression of IL-6 have been described in CCA cells, and IL-6 can promote the growth of malignant cholangiocytes in vitro [5,6]. Furthermore, the role of IL-6 in promoting CCA growth has been demonstrated in both cell culture and tumor cell xenograft models [7,8]. No effective medical treatment method is available for CCA currently. Selectively targeting specific augmented molecules such as COX-2 and/or IL-6 in CCA may improve the outcomes of CCA treatment. To develop new strategy for therapeutic intervention in CCA, we assumed that the combination of inhibiting both IL-6 and COX-2 could achieve synergistic effects to suppress the proliferation and invasion of CCA cells. In this study, we used human extra-hepatic CCA cell line QBC939 to investigate whether IL-6 receptor antibody could enhance the inhibitory effects of NS-398, a selective COX-2 inhibitor, on cell proliferation and invasion. Human extra-hepatic cholangiocarcinoma cell line QBC939 was purchased from ATCC and maintained as mono-layers in Dulbecco’s Modified Eagle’s Medium (DMEM) supplemented with 10% Fetal Bovine Serum (FBS, Gibco, USA. ), 100 unit/ml penicillin and 100 mg/ml streptomycin in a humidified atmosphere of 95% air and 5% CO2 at 37. CCA cells at 70-80% subconfluence were employed in all experiments. Cell proliferation was determined by CCK-8 assay. QBC939 cells were seeded at a density of 8 × 104 cells/well in 96-well microplates. After 12 h, cells were treated with NS-398 (25, 50, 100 μmol/l, Jiangsu Beyotime Institute of Biotech, Jiangsu, China) or/and IL-6R antibody (0.1, 1.0, 10 μg/ml, Boster Biotech, Wuhan, China). In some experiments, 300 pg/ml PGE2 (Sigma, USA) was added to the wells prior to the addition of NS-398 or IL-6R antibody. After 24, 48, or 72 h respectively, CCK-8 solution was added to each well and incubated for different time (1-4 h) to achieve the best absorbance values. Absorption was measured by an enzymelinked immunoabsorbent assay reader at 450 nm, recorded as A value. The negative control well with no cells was used as zero point of absorbance. Each well was read three times in sextuplicate. The cell proliferation Inhibition Rate (IR) was calculated as: (1- Aexperimental group value/Acontrol group value) × 100%. The PGE2 and IL-6 levels in the supernatant of QBC939 cells were quantitated by ELISA. Cells were seeded into 96-well microplates (8.0 × 104/well) and allowed to adhere overnight. The cells were incubated with different reagents for 24, 48, 72 h, respectively. The supernatants were then aspirated and the levels of PGE2 and IL-6 were determined by PGE2 and IL-6 ELISA detection kits (Jiangsu Beyotime Institute of Biotech, Jiangsu, China). Transwell chamber (Corning Incorporated, USA) was used to evaluate the invasion of QBC939 cells in vitro. Briefly, QBC939 cells (6 × 103 in 50 μl serum-free DMEM) were seeded in the upper chamber while DMEM with 10% fetal bovine serum was added to the lower chamber. For intervention experiments, 1.2 × 105/ml QBC939 cells were incubated with different concentration of NS-398 or IL-6R antibody and 6 × 103 cells in 50 μl serum-free DMEM were seeded in the upper chamber. The cells were incubated at 37ºC in 5% CO2 for 24 h. Next the cells from the upper chamber were removed and only the transmigrated cells on the lower side of the filter were fixed with 4% paraformaldehyde for 30 min and stained with 0.5% crystal violet for 5 min. After washing with distilled water, the stained cells were counted under microscope in three different fields. The assay was performed in triplicate and three times independently. Data were presented as mean ± SD. Student’s t-test was used for statistical analysis. P<0.05 was considered significant differences. QBC939 cells were treated with NS-398 and IL-6R antibody alone or in combination. CCK-8 assay showed that NS-398 inhibited the proliferation of QBC939 cells in time-dependent manner: IR% was 13.0 ± 10.1 at 24 h, 22.1 ± 9.7 at 48 h, and 42.3 ± 15.8 at 72 h. In addition, the inhibition of the proliferation of QBC939 cells was dependent on the concentration of NS-398 (Figure 1A). Similarly, IL-6R antibody inhibited the proliferation of QBC939 cells in time and concentration dependent manner (Figure 1B). However, the inhibition of QBC939 cell proliferation by NS-398 or IL-6R antibody was abolished by pre-treatment with PGE2, while the proliferation of QBC939 cells was inhibited significantly with the combination of NS-398 (100 μmol/l) and IL-6R antibody (10 μg/ml) at 24 h (IR%=59.6 ± 14.2), 48 h (IR %=72.8 ± 18.4) and 72 h (IR%=86.2 ± 13.8) (P<0.01 vs. control, Figure 1C). These results demonstrate that NS-398 and IL-6R antibody synergistically inhibit the proliferation of CCA cells, while PGE2 could relieve the inhibition of CCA cell proliferaion by NS-398 and IL-6R antibody. Figure 1. 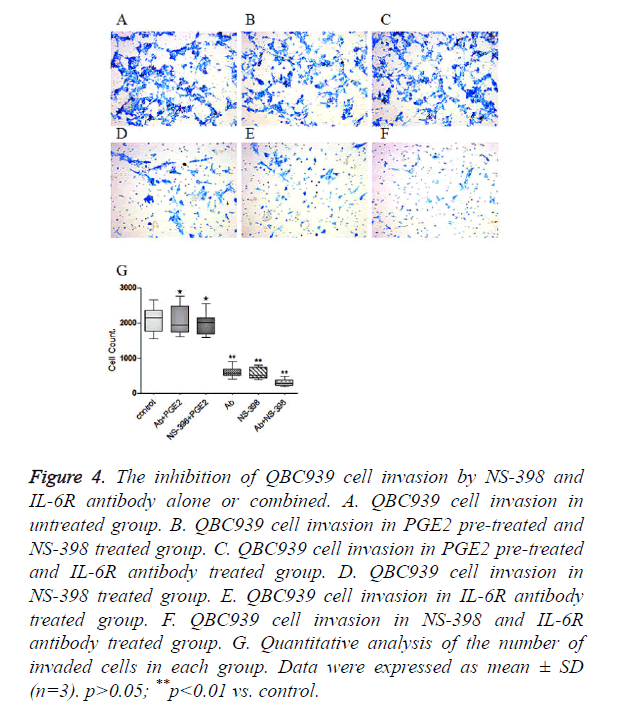 The inhibition of QBC939 cell proliferation by NS-398 and IL-6R antibody alone or combined. A. Effect of NS-398 on QBC939 cell proliferation. B. Effect of IL-6R antibody on QBC939 cell proliferation. C. The anti-proliferation effect of NS-398 or IL-6R antibody on QBC939 cells was abolished by pre-treatment with PGE2 and a significant increase in inhibition rate of proliferation was observed in NS-398/IL-6R antibody combined group. Data were expressed as mean ± SD (n=6). Next, we examined the effects of NS-398 or/and IL-6R antibody on PGE2 production in CCA cells. QBC939 cells were treated with NS-398 and IL-6R antibody alone or in combination, and the concentration of PGE2 in cell culture medium was measured by ELISA. The results showed that NS-398 inhibited PGE2 production in QBC939 cells in concentration-dependent manner: PGE2 production was suppressed by 25.8%, 35.2% and 52.5%, after treatment with 25, 50 and 100 μmol/l of NS-398, respectively, at 24 h (Figure 2A). In addition, the inhibition of PGE2 production in QBC939 cells was dependent on the duration of NS-398 treatment (Figure 2A). Similarly, IL-6R antibody inhibited PGE2 production in QBC939 cells in time and concentration dependent manner (Figure 2B). However, PGE2 production in QBC939 cells was inhibited significantly with the combination of NS-398 (100 μmol/l) and IL-6R antibody (10 μg/ml) at 24 h, 48 h and 72 h (P<0.01 vs. control, Figure 2B). These results demonstrate that NS-398 and IL-6R antibody synergistically inhibit PGE2 production in CCA cells. Figure 2. The inhibition of PGE2 release from QBC939 cells by NS-398 and IL-6R antibody alone or combined. A. Effect of NS-398 on PGE2 release from QBC939 cells. B. 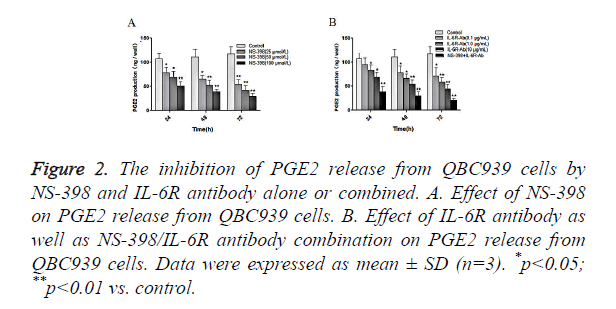 Effect of IL-6R antibody as well as NS-398/IL-6R antibody combination on PGE2 release from QBC939 cells. Data were expressed as mean ± SD (n=3). *p<0.05; **p<0.01 vs. control. Furthermore, we examined the effects of NS-398 or/and IL-6R antibody on IL-6 production in CCA cells. QBC939 cells were treated with NS-398 and IL-6R antibody alone or in combination, and the concentration of IL-6 in cell culture medium was measured by ELISA. The results showed that NS-398 inhibited IL6 production in QBC939 cells in time and concentration dependent manner (Figure 3A). Similarly, IL-6R antibody inhibited IL6 production in QBC939 cells in time and concentration dependent manner (Figure 3B). However, IL6 production in QBC939 cells was inhibited significantly with the combination of NS-398 (100 μmol/l) and IL-6R antibody (10 μg/ml) at 24 h, 48 h and 72 h (P<0.01 vs. control, Figure 3C). These results demonstrate that NS-398 and IL-6R antibody synergistically inhibit IL6 production in CCA cells. Figure 3. The inhibition of IL6 release from QBC939 cells by NS-398 and IL-6R antibody alone or combined. A. 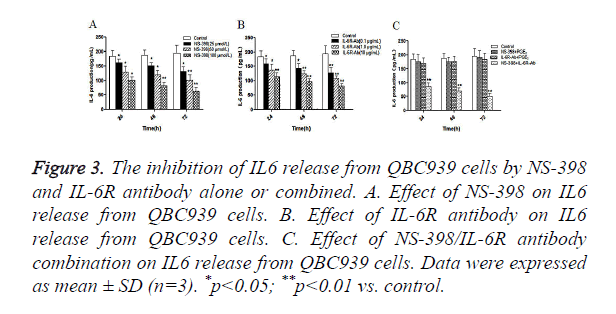 Effect of NS-398 on IL6 release from QBC939 cells. B. Effect of IL-6R antibody on IL6 release from QBC939 cells. 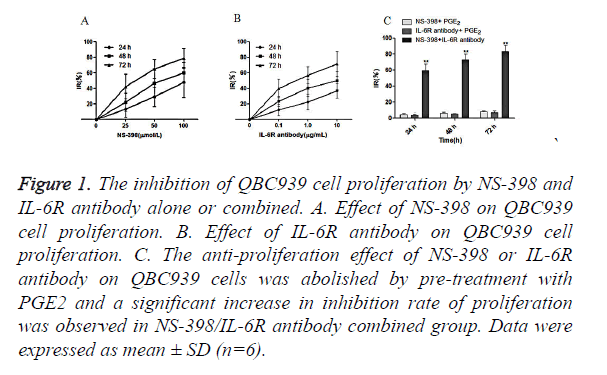 C. Effect of NS-398/IL-6R antibody combination on IL6 release from QBC939 cells. Data were expressed as mean ± SD (n=3). *p<0.05; **p<0.01 vs. control. QBC939 cells were treated with NS-398 and IL-6R antibody alone or in combination. Transwell invasion assay showed that the number of invaded cells was 2092 ± 419 in control cells (Figure 4A), but was reduced to 558 ± 159 in cells treated with 100 μmol/l NS-398 (Figure 4D), and to 603 ± 156 in cells treated with 10 μg/ml IL-6R antibody (Figure 4E). When cells were treated with both 100 μmol/l NS-398 and 10 μg/ml IL-6R antibody, the number of invaded cells was reduced to only 305 ± 104 (Figure 4F) (P<0.01, vs. control). Notably, pre-treatment with 300 pg/ml PGE2 significantly increased the number of invaded cells in cells treated with 100 μmol/l NS-398 or 10 μg/ml IL-6R antibody (Figures 4B and 4C). The quantitative analysis of the number of invaded cells was shown in Figure 4G. Collectively, these data indicate that NS-398 and IL-6R antibody synergistically inhibit the invasion of CCA cells, while PGE2 could relieve the inhibition of CCA cell invasion by NS-398 and IL-6R antibody. Figure 4. The inhibition of QBC939 cell invasion by NS-398 and IL-6R antibody alone or combined. A. QBC939 cell invasion in untreated group. B. QBC939 cell invasion in PGE2 pre-treated and NS-398 treated group. C. QBC939 cell invasion in PGE2 pre-treated and IL-6R antibody treated group. D. QBC939 cell invasion in NS-398 treated group. E. QBC939 cell invasion in IL-6R antibody treated group. F. QBC939 cell invasion in NS-398 and IL-6R antibody treated group. G. Quantitative analysis of the number of invaded cells in each group. Data were expressed as mean ± SD (n=3). p>0.05; **p<0.01 vs. control. The interaction of tumor cells with their microenvironment has been recognized as an important factor which not only determines the progression and invasion of cancer but also could contribute to drug resistance of cancer [9,10]. It is known that CCA is an aggressive malignancy with very poor prognosis and high resistance to current drug-based therapies [11,12]. Therefore, focus on the microenvironment of CCA may offer new opportunity to improve the therapeutic response of CCA. In this study we made several important findings. First, we observed that PGE2 level in the supernatant of QBC939 cells was reduced after the administration of NS-398 and/or IL-6R antibody. Second, IL6 level in the supernatant of QBC939 cells was also reduced after the administration of NS-398 and/or IL-6R antibody. Third, the inhibition of QBC939 cell proliferation and invasion was associated with the reduced production of PGE2 and IL-6. In addition, the inhibitory effects of NS-398 and IL-6R antibody on QBC939 cell proliferation and invasion could be abolished by PGE2. Finally, synergistic effects were observed with the combination of NS-398 and IL-6R antibody treatment versus treatment alone. It is still controversial whether the effects of COX-2 inhibitor are mediated predominantly through the inhibition of COX-2 activity and the production of PGE2. Relevant studies have indicated that both COX-dependent and COX-independent mechanisms are involved in the inhibition of colorectal tumor growth by Non-Steroidal Anti-Inflammatory Drugs (NSAIDs) [13-17]. However, in this study, we provided evidence that inhibition of COX-2 activity by NS-398, alone or in combination with other new targeted anticancer drugs decreased PGE2 production and inhibited cell proliferation and invasion. We also showed that IL-6R antibody inhibited PGE2 production in the microenvironment of tumor cells. These data indicate that the inhibition of PGE2 production in CCA microenvironment either by COX-2 inhibitor or IL-6R antibody may contribute to the anti-tumor effects of these agents on CCA. However, further studies are needed to understand the molecular mechanism by which IL-6R antibody could inhibit PGE2 production in CCA microenvironment. An interesting finding was the inhibition of IL-6 production by different concentrations of NS-398, which further indicates that there is a cross-talk between COX-2 and IL-6 in CCA cells. Furthermore, the inhibition of QBC939 cell proliferation and invasion by NS-398 and IL-6R antibody could be abrogated by pre-treatment with PGE2. These data suggest that PGE2 may drive the proliferation and invasion of CCA cells while COX-2 and IL-6 may cross-talk with each other to increase the production of PGE2 and IL6 to create a favourable microenvironment for CCA cells to proliferate and invade. Consequently, the targeting of both COX-2 and IL-6 may achieve synergistic effects to block the cross-talk of COX-2 and IL-6 and inhibit CCA cell proliferation and invasion. This may explain why the combination of NS-398 and IL-6R antibody exhibited synergistic effects to inhibit the proliferation and invasion of CCA cells as we observed in this study. In summary, our results demonstrated the synergistic anti-tumor effect of NS-398 and IL-6R antibody on CCA cells. These findings provide a rationale for the development of COX-2 and IL6 based combination therapy for effective treatment of CCA patients with poor prognosis. Lin F, Luo J, Gao W, Wu J, Shao Z, Wang Z, Meng J, Ou Z, Yang G. COX-2 promotes breast cancer cell radioresistance via p38/MAPK-mediated cellular anti-apoptosis and invasiveness. Tumour Biol 2013; 34: 2817-2826. Zeng C, Chen L, Yang Z, Sun S. The close correlation between heparanase and COX-2 expression in lymphangiogenesis of cervical cancer. Med Oncol 2014; 31: 314. Taddei A, Fabbroni V, Pini A, Lucarini L, Ringressi MN, Fantappič O, Bani D, Messerini L, Masini E, Bechi P. Cyclooxygenase-2 and inflammation mediators have a crucial role in reflux-related esophageal histological changes and Barretts esophagus. Dig Dis Sci 2014; 59: 949-957. Jongthawin J, Chusorn P, Techasen A, Loilome W, Boonmars T, Thanan R, Puapairoj A, Khuntikeo N, Tassaneeyakul W, Yongvanit P, Namwat N. PGE2 signalling and its biosynthesis-related enzymes in cholangiocarcinoma progression. Tumour Biol 2014; 35: 8051-8064. Tangkijvanich P, Thong-ngam D, Theamboonlers A, Hanvivatvong O, Kullavanijaya P, Poovorawan Y. Diagnostic role of serum interleukin 6 and CA 19-9 in patients with cholangiocarcinoma. Hepatogastroenterology 2003; 51: 15-19. Braconi C, Swenson E, Kogure T, Huang N, Patel T. Targeting the IL-6 dependent phenotype can identify novel therapies for cholangiocarcinoma. PLoS One 2010; 5: e15195. Meng F, Yamagiwa Y, Ueno Y, Patel T. Over-expression of interleukin-6 enhances cell survival and transformed cell growth in human malignant cholangiocytes. J Hepatol 2006; 44: 1055-1065. Yamagiwa Y, Meng F, Patel T. Interleukin-6 decreases senescence and increases telomerase activity in malignant human cholangiocytes. Life Sci 2006; 78: 2494-2502. Ungefroren H, Sebens S, Seidl D, Lehnert H, Hass R. Interaction of tumor cells with the microenvironment. Cell Commun Signal 2011; 9: 18. Chaffer CL, Weinberg RA. A perspective on cancer cell metastasis. Science 2011; 331: 1559-1564. Sia D, Tovar V, Moeini A, Llovet JM. Intrahepatic cholangiocarcinoma: pathogenesis and rationale for molecular therapies. Oncogene 2013; 32: 4861-4870. Leyva-Illades D, McMillin M, Quinn M, Demorrow S. Cholangiocarcinoma pathogenesis: Role of the tumor microenvironment. Transl Gastrointest Cancer 2012; 1: 71-80. Richter M, Weiss M, Weinberger I, Furstenberger G, Marian B. Growth inhibition and induction of apoptosis in colorectal tumor cells by cyclooxygenase inhibitors. Carcinogenesis 2001; 22: 17-25. Tinsley HN, Grizzle WE, Abadi A, Keeton A, Zhu B, Xi Y, Piazza GA. New NSAID targets and derivatives for colorectal cancer chemoprevention. Recent Results Cancer Res 2013; 191: 105-120. Chakraborti AK, Garg SK, Kumar R, Motiwala HF, Jadhavar PS. Progress in COX-2 inhibitors: a journey so far. Curr Med Chem 2010; 17: 1563-1593. Hwang DH, Fung V, Dannenberg AJ. National Cancer Institute workshop on chemopreventive properties of nonsteroidal anti-inflammatory drugs: role of COX-dependent and-independent mechanisms. Neoplasia 2002; 4: 91-97. Fujii R, Imanishi Y, Shibata K, Sakai N, Sakamoto K, Shigetomi S, Habu N, Otsuka K, Sato Y, Watanabe Y, Ozawa H, Tomita T, Kameyama K, Fujii M, Ogawa K. Restoration of E-cadherin expression by selective Cox-2 inhibition and the clinical relevance of the epithelial-to-mesenchymal transition in head and neck squamous cell carcinoma. J Exp Clin Cancer Res 2014; 33: 40.